Sharebot is a dynamic company that is devoted to democratizing access to high-precision, reliable and easy-to-use 3D printers. Our 3D printers optimize the entire design and manufacturing workflow and transform every space into a personal creation center. Video of making of futuristic Rinspeed SNAP vehicle parts with Sharebot professional 3D printers. You can admire our 3D printers XXL+ and Q working to prototype and produce 120 parts needed for this project realized after Sharebot’s training and support intervention. The partnership between Sharebot and Techniplas explained by Brent Zollinger: in XponentialWorks showroom in Ventura and in all the venues all over the world the company has installed Sharebot 3D printers. That’s how engineers and technicians use our additive technology to innovate the automotive industry. 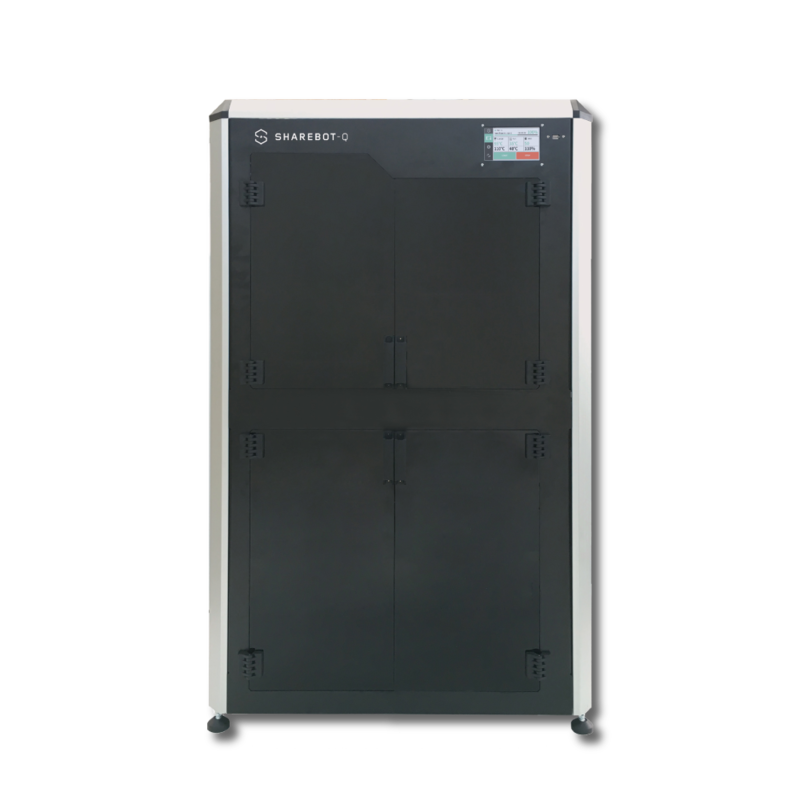 Sharebot XXL Plus, one of our big size professional 3D printers, realize large models and prototypes with the highest resolution and speed. It can be used to create samples or functioning tools with different materials. 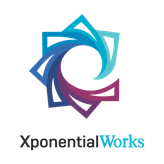 Our partner of Techniplas works with XXL Plus with an intensive use. 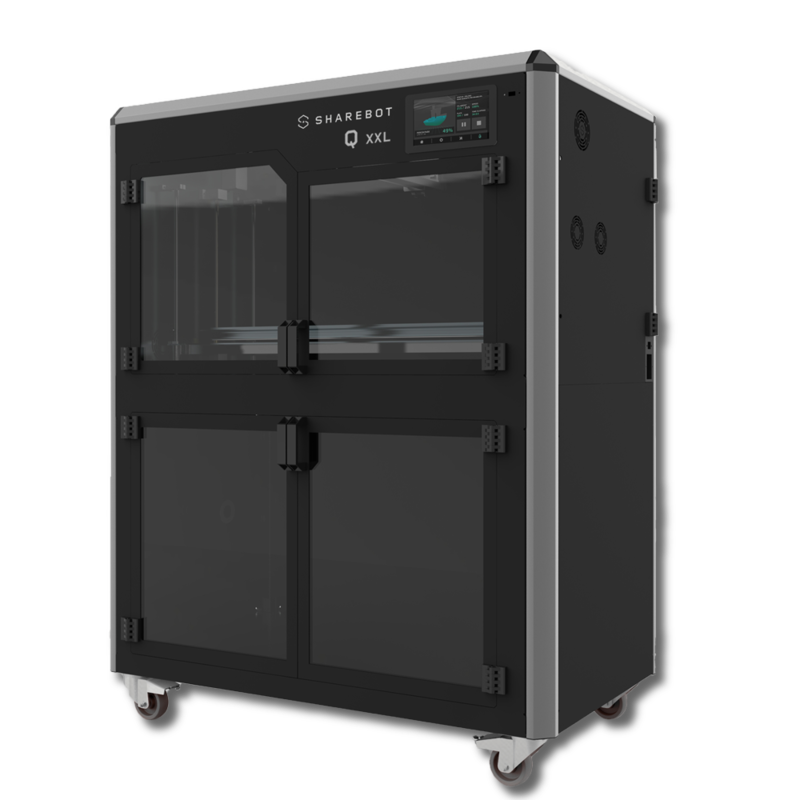 Sharebot Qxxl is a big size professional 3D printer with FFF technology. Evolution of Sharebot Q, Qxxl is a professional working tool that combines the main Q features (printing bed autocalibration system, Sharebox3D interface and remote management) with the largest building area (27.5 x 15 x 12 in) to provide professionals an advancedand innovative tool for their workflows and transfrorm their working environment in an Industry 4.0. Sharebot Q is a professional 3D printer with an A3 format printing area (its dimension are: 15.7 x 11.8 x 11.8 in) and it uses FFF (Fused Filament Fabrication) technology to realize professional prototypes with high quality and precision. The printer allows to manage all the aspects of the printing process from the user’s remote device (computer, smartphone or tablet), optimizing the professional workflow; Q allows also to manage different operations at the same time from the same platform (even on different 3D printers) with just a click. Moreover The web interface gives the possibilty to monitor the printing process thanks to the integrated webcam. The printer has also a big useful case under the magnetic printing plate with another spool case integrated: the box can be used to store materials and tools useful for the printing process. The printing process with Sharebot Q is easier thanks to a filament double dragging system with engines both on the extruder and next to the spool (bowden system) improving the extrusion. The professional user experience is also optimized by the filament sensor which control the operation, avoiding any failure in case of problem. 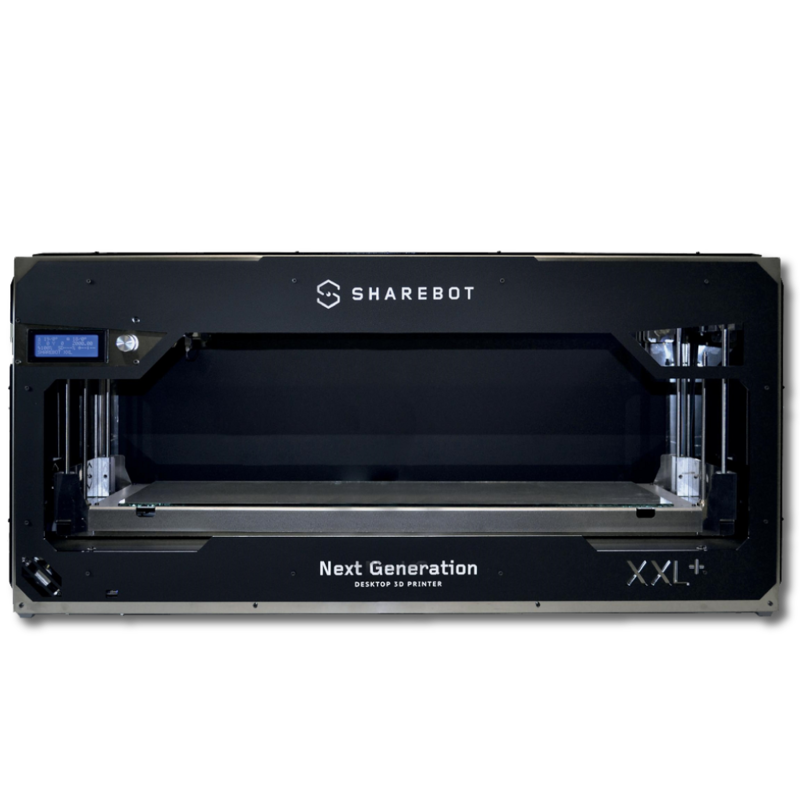 Sharebot XXL Plus is a professional 3D printer with a large building volume: it’s the upgrade of the successful Sharebot XXL; like its parent, Sharebot XXL Plus uses the FFF (Fused Filament Fabrication) technology to build big size prototypes and models. XXL Plus has the same external dimensions of XXL and the same innovative design. The printing area is larger, 27.7 x 9.85 x 7.88 in and it introduces a new heating system for the printing bed. The printer also has a new X and Y axes calibration system (the Y axis now has two independent engines) which allows to have a more precise printing process for high quality models and prototypes: this makes XXL Plus even more suited for professional than its predecessor. Our technicians also added a new levelling system for the Z axis for a more stable process. Sharebot XXL Plus need low maintenance and it’s ready to print in just few minutes: throught the easy, intuitive and nice interface you’ll be in full control of all the printing process with the possibily to adjust and motify all the printing setting set in the slicing software. The autocalibration system of the innovative printing bed with removable magnetic printing plate allows the professional to start printing without any problem: the user have the full control on every printing setting from the 3.2″ LCD touch screen display. Sharebot 42 has an integrated videocamera with web connectivity: from the web interface, compatible with every device, the professional user will have the possibility to manage the printing process and see the development from the webcam. Another new features is the filament control: a sensor will stop the printing it if the material ends or it’s obstructed. 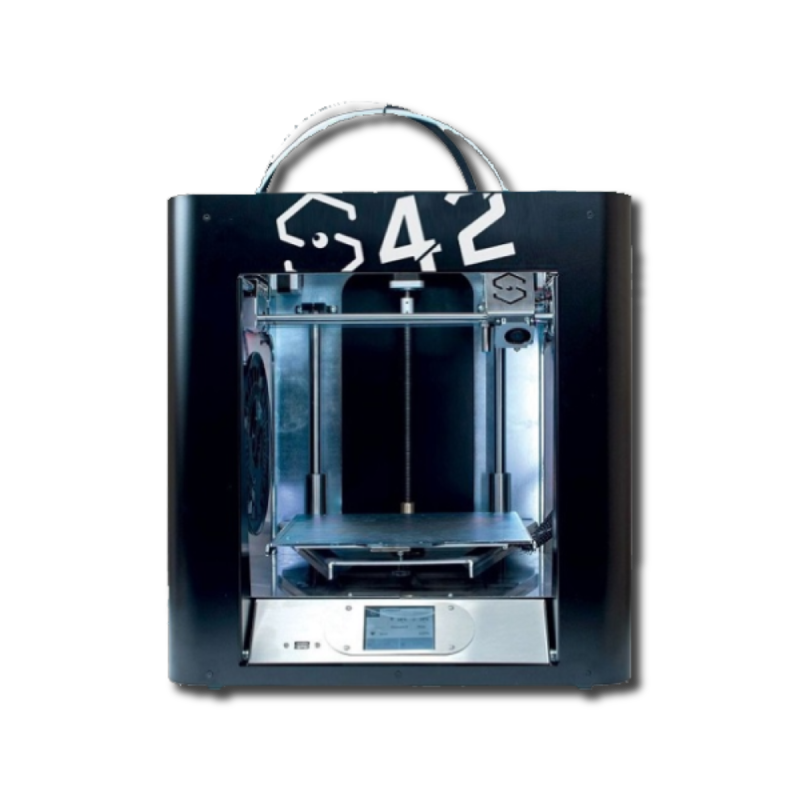 Sharebot 42 can print with many different professional 3D printing materials: to have the best quality with each one, it’s possible to change the nozzle (applying nozzles from 0.15 – 0.3 in), depending of the material used, allowing you to obtain the best from Sharebot 42 printing quality.